I’m from a cold country with long and snowy winters,and one thing you learn is to keep yourself warm. A great way to do this is with a luxurious, soft and stylish alpaca fibre socks from Perilla. The alpaca fibre is hollow and lightweight and gives a lovely warmth. It’s compared to the likes of silk for its strength and cashmere for its softness – and so very important compared to wool, which is so often used for warmth but tends to feel itchy. The alpaca is not, so this is something perfectly suitable for sensitive skin. I am now a happy owner of a pair of bright raspberry colored socks that reach all the way up to my knees. These look absolutely stunning when worn with my leather boots to give that pop of color. But so importantly, I feel comfortably warm. 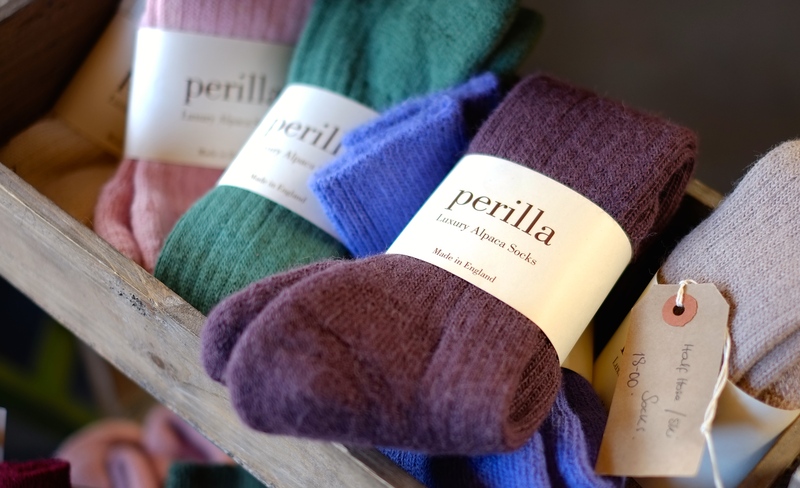 Perilla has a lovely website that offers more than just socks, although if you’re after that perfect sock for cuddling up on the couch or walking the dog then definitely have a look. You’ll find something for women, men and children. But socks aside, you can complete that winter warm look by adding a pashmina scarf made from a soft cashmere and silk mix, maybe a pair of alpaca knitted arm warmers. But I think I would get myself a cashmere wrap and this mostly because it’s such a versatile garment. I use these so much instead of putting a sometimes-restricting jacket on I’d rather nonchalantly wrap a shawl around my shoulders. Very chic and it looks good both worn on a casual day or a formal event, especially with this lovely mix of silk and cashmere. Perilla, being mostly known for that soft alpaca, was created in 2006 by Sandra Morton. She was looking around trying to find a pair of comfortable bed socks for her daughter but couldn’t find that perfect pair. The company started out using British-produced alpaca but soon found that they needed much more and are now importing from Peru, and in that way making a real difference to the farmers who live there. It’s always nice to do business with a company that gives that extra back. So whether you’re a country girl, city chic or just cozying up, take a look at what they have to offer you. Perilla is avalaible in stores and online.